Countryside in Western Sicily is quiet and pleasant: soft hills with old “trazzere”, little roads for farmers, pretty “agriturismo” where a taste of local wine and food becomes an unforgettable gourmet experience, charming towns and interesting archaeological sites. If you fancy a holiday surrounded by that kind of atmosphere, take a look to our Sicily villas in the country. 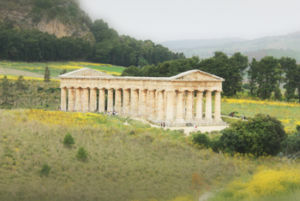 One of the most famous archaeological parks in Sicily is the one in Segesta, an ancient city founded by the Elymians (a Greek population escaping from Troy, the legend says) where an incredibly well-preserved Doric temple (built about 2500 years ago) and a stunning amphitheatre can be visited nowadays. The site is set among verdant hills with typical Mediterranean shrub, and the whole area is very quiet and intimate. The first thing to visit is the Temple: such an ancient building, yet so extraordinarily well preserved! The amphitheatre is the main sight of the whole acropolis, set on a hilltop that can be both reached by feet or by shuttle service running every 30 minutes. If your holiday is planned in July or August, don’t forget to check for the annual theatre festival that takes place in the ancient amphitheatre: an absolutely unique setting for a play! Together with Segesta, the most important city for the Elymians was the enchanting hamlet of Erice, on top of a mountain overlooking the whole Western shore from the city of Trapani (just 15 minutes away) to the shores of Marsala (South) and San Vito Lo Capo (East). The hamlet can be reached via car or bus, but if you’re looking for a more thrilling experience we recommend you take the cableway from the city of Trapani: the panorama will make your jaw drop! This town is rich in history and legend: its name comes from “Erix”, a mythological character, the son of Aphrodite, killed by Heracles. After the foundation, the town was occupied by the Romans and the Arabs, as well as the Normans. Nowadays, Erice is a beautiful medieval hamlet: the best thing to do to catch its dreamy atmosphere is to walk through its narrow streets filled with antique shops and pretty cafés, ending in pleasant courtyards with flowery balconies and stunning monuments. Panoramic viewpoints are almost everywhere (including from our villas in Erice! ): if you’re lucky enough to visit Erice when the sky is very clear, you’ll be able to see the islands of Ustica and Pantelleria, if not even Cape Bon in Tunisia. Two stunning castles can be visited: one, founded by the Normans upon the ruins of a former Roman temple dedicated to “Venere Ericina” (Venus), and one built during the Middle Ages. Interesting monuments and sights include the gardens of the castle, the Dome of the Assunta, the Spanish district and plenty of religious monuments (Erice was once called “Town of 100 churches”). The hamlet is perfect for a visit both in summer, when the chilly breeze will bring some relief from the high temperatures of the coastal plain, and in winter, when the atmosphere gets a bit foggy and you’ll feel you’re being taken back to the Middle Ages. During your excursions, don’t forget to indulge yourself with a delicious local treat: “Genovesi alla crema”, pastry with custard and icing sugar, best tasted warm!